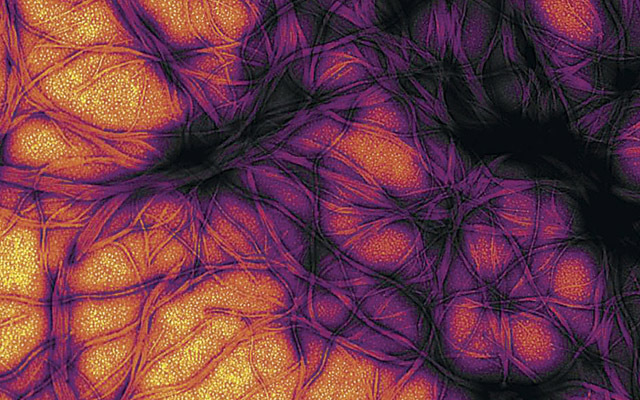 Prion proteins expressed in E. coli bacteria. Image courtesy of NIAID. By the time symptoms of sporadic Creutzfeldt-Jakob disease (sCJD) are typically discovered, death is looming and inevitable. But, in a new study, researchers at University of California San Diego School of Medicine with colleagues at the National Institutes of Health and UC San Francisco, report finding tell-tale evidence of the condition’s infectious agent in the eyes of deceased sCJD patients, making the eye a potential source for both early CJD detection and prevention of disease transmission. Sigurdson, with co-corresponding authors Michael D. Geschwind, MD, PhD, professor of neurology at University of California San Francisco Memory and Aging Center, Byron Caughey, PhD, at the NIH Rocky Mountain Laboratories in Montana, and others sampled eyes and then NIH researchers used a highly sensitive real-time assay called the RT-QuIC test developed by Caughey to measure postmortem prion seeding in different tissues of the eye, such as cornea, lens, ocular fluid, retina and optic nerve. Prions were found throughout the eyes of all eleven tested sCJD patients (who had agreed to donate their eyes upon death), with the highest seed levels in the retina — in some cases only slightly lower than in the brain. Analyses of the eyes from six control samples without diagnosed sCJD were negative for prions. “Collectively, these results reveal that sCJD patients accumulate prion seeds throughout the eye, indicating the potential diagnostic utility as well as a possible biohazard,” wrote the authors. The RT-QuIC test is used by clinicians to diagnose sCJD in people, usually through cerebrospinal fluid and nasal brushings. The researchers plan to further evaluate its utility in eye tests, and expand to evaluate the eyes of patients with Alzheimer’s disease, Parkinson’s disease or dementia with Lewy bodies to determine whether aggregated proteins from those conditions are present. Funding for this research came, in part, the National Institutes of Health (NS069566, NS076896, R01-AG031189, R01-NS088485), the Michael J. Homer Family Fund, the Intramural Research Program of the NIAID, the Equity in Brain Health at the Global Brain Health Institute and a gift to NIAID from Mary Hilderman Smith, Zoe Smith Jaye and Jenny Smith Unruh in memory of Jeffrey Smith.